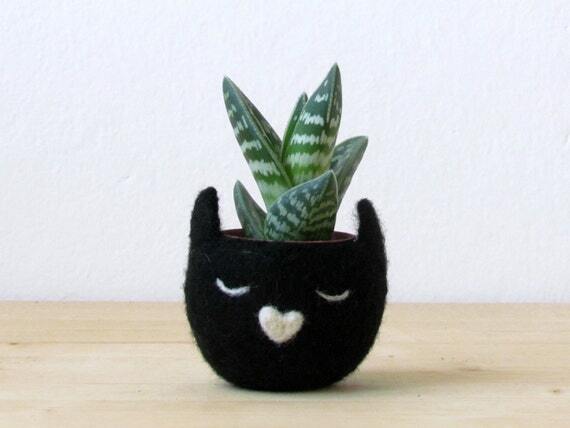 Even if you’re cursed with a black thumb, you’ll lust after these cute cat planters. 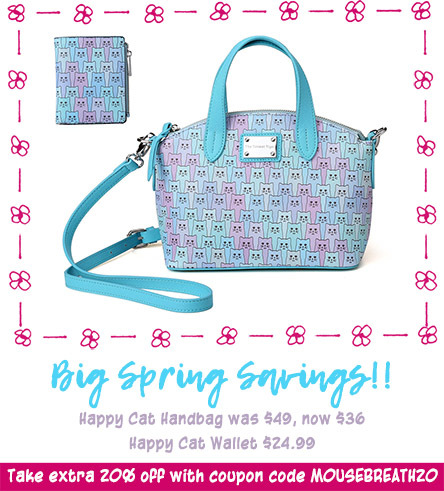 Some handcrafted, some kitsy-vintage, they’re all purrfect vessels in which to cultivate your catnip crops. Plants pictured are not included, so you can pick your own greenery to kill. 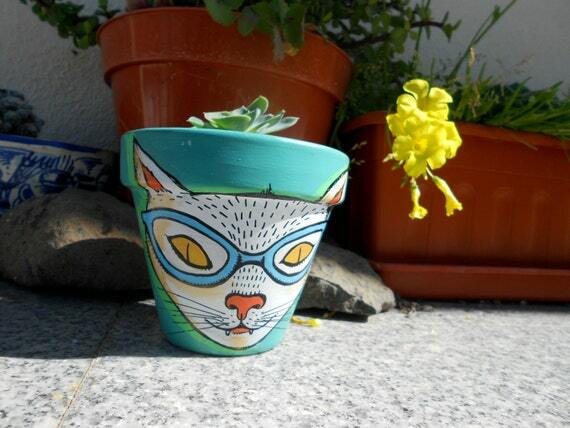 First up: the “Nerd Cat Planter” is handpainted by an Dona Zerzanga, an artist in Lisbon, Portugal. You can order one just like this (LOVE the colors! 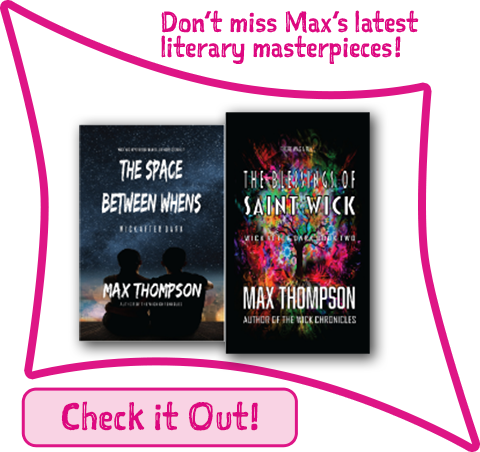 ), or request the color scheme (and wording) of your choice. At less than $17, you can afford to buy a bunch! More info here. 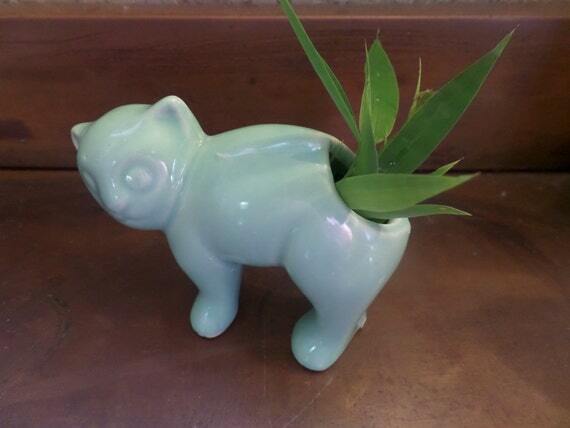 This vintage cat planter is $16.50, and features an opening at the business end of the cat. (Plant not included.) More info here. Is your cat a superhero or supervillain (or maybe you have one of each)? 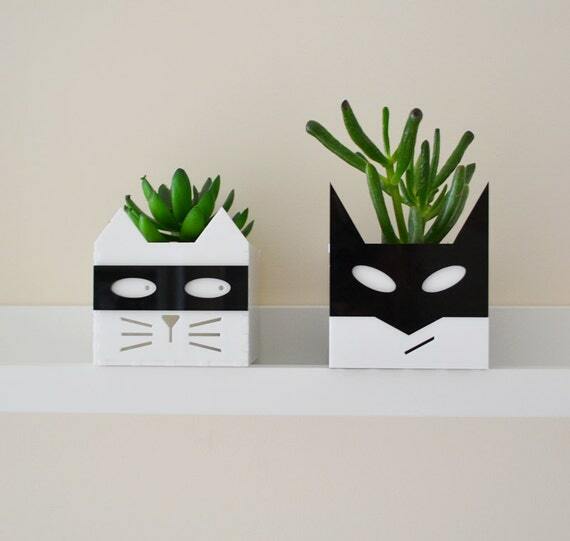 Celebrate with one or both of these contemporary cat planters. Ideally sized for small cactus, succulent or house plant, it is made of black and white acrylic that has been carefully cut and engraved. $19.92 More info here. 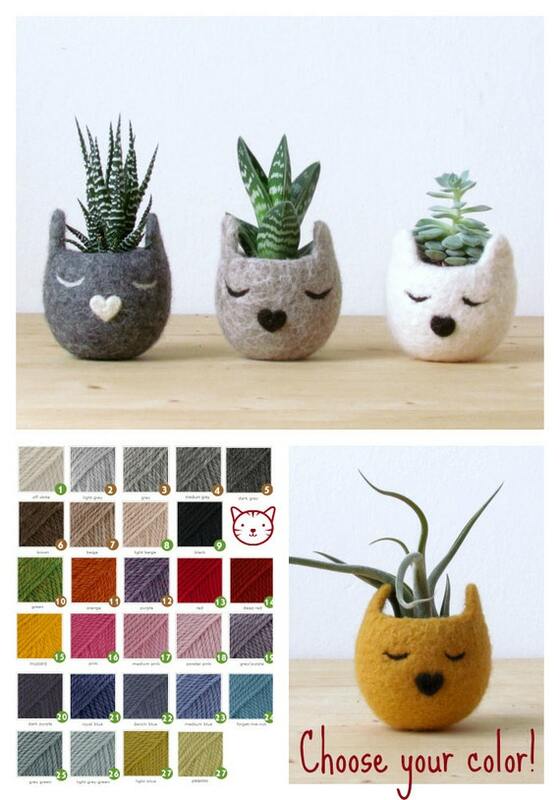 The next cat planter is hand crafted of felt, and is available in a full spectrum of colors. 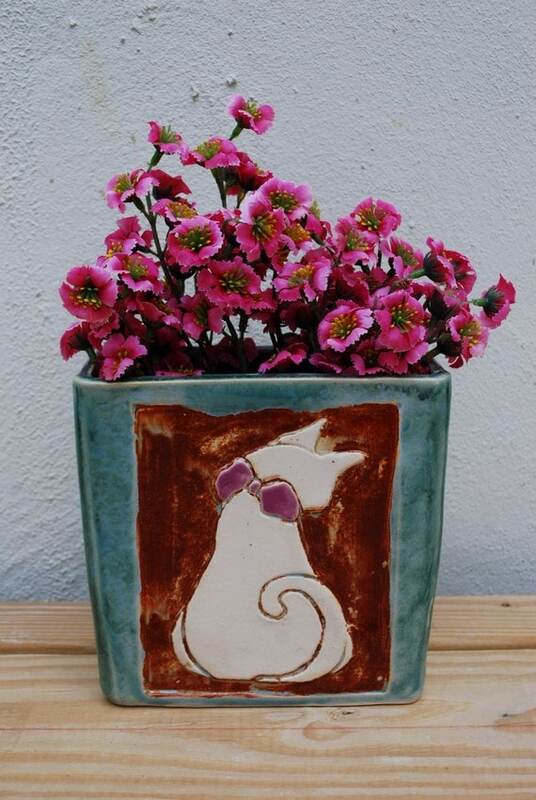 One for $24, or three cat planters for $60. They’re sized for 2″ plastic pots. Shipped from Italy. More info here. 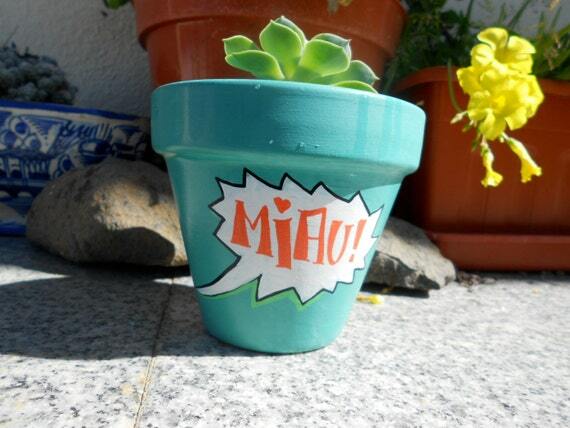 If you’re on a budget and you care about Mother Earth, this next planter’s for you. It’s only $5, and it made of recycled plastic bottles. 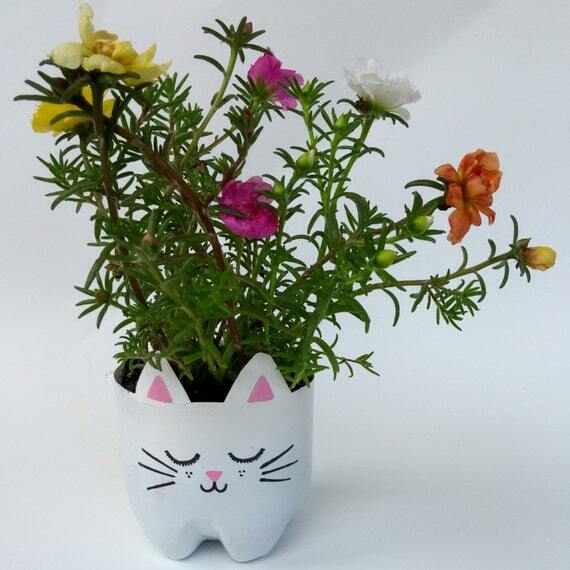 It comes with 1) One plastic cat planter, 2) Potting Soil, 3) Root rocks, 4) Planting instructions, and if requested, a free packet of cat grass seeds. Got a happy smiling ginger? Here’s your planter. 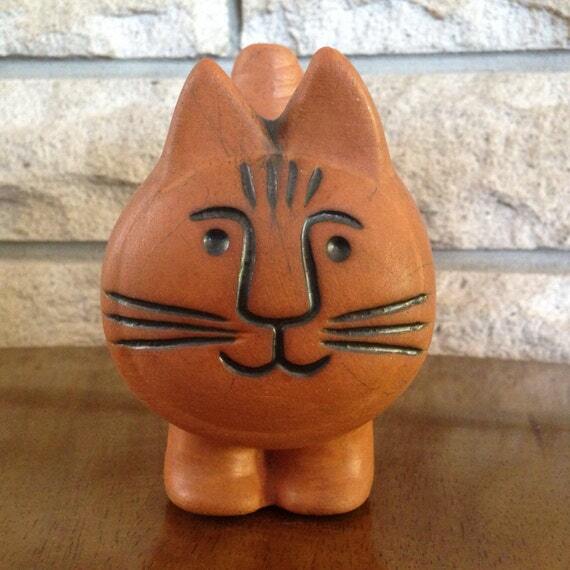 It’s vintage terra cotta and will set you back $24. More info here. 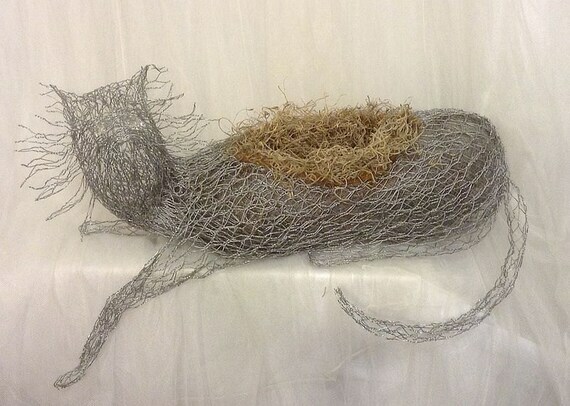 This sculptural wire cat planter is made with galvanized hex mesh, formed and sculpted by hand to lay on shelves,walls, and fence areas.It’s lined with coco liner to accommodate a 6″ pot or silk/fresh flower arrangements. $85.00 More info here. This beauty combines blue and brown glazes combined on lead-free ivory stoneware. It was created from slabs of raw clay and then altered. This glaze combination was achieved over a 10 year period of trial and error. It wears as well indoors as outside. Don’t forget! Today’s the last day to enter for a chance to win a jug of Tidy Cats LIGHTWEIGHT clumping cat litter. TEN WINNERS!